Coffee has been a big part of my husband's life since starting his new job and has started to become a big part of my life again since having a baby! There is always a little coffee left in the coffee pot after Chris goes to work so one morning I decided I'd make some use of it! 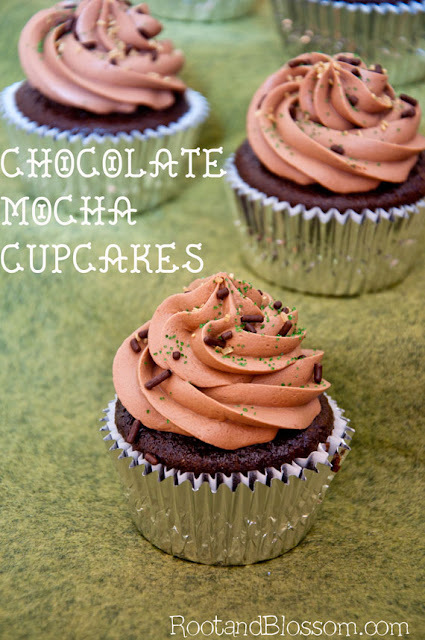 The coffee in the cupcake helps to bring out the chocolate flavor and in the frosting it provides a tasty hint of mocha flavor to the buttercream. In a large bowl combine the Greek yogurt, coffee, milk, egg whites and vanilla; beat until well blended. Combine the flour, sugar, cocoa, baking soda, baking powder and salt; add to coffee mixture. Beat for 2 minutes or until well blended. Fill paper lined muffin tin 2/3 way. Bake at 350' for 13-18 minutes or until toothpick inserted in the middle of cupcake comes out clean. Beat butter by itself for a couple minutes in the mixer with the paddle attachment on medium speed. Add your powdered sugar a cup at a time on the lowest speed. Add the last 3/4 of powdered sugar with the 1/4 cup baking cocoa. Once sugar has mixed with butter turn mixer back to medium and add the salt, vanilla, and coffee. Beat for 3 minutes. ***To have enough frosting to pipe the cupcakes double the frosting recipe. If you want the frosting to be more chocolate-ty up the cocoa and bring down the powdered sugar but be careful about making the frosting bitter.